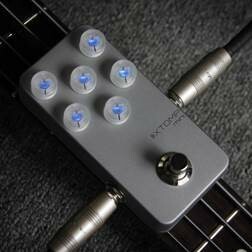 Like its bigger brother (Xtomp), the Xtomp Mini can be transformed into over 150 classic, vintage and iconic guitar amp heads, effects pedals and cabinet simulations. The library is stored by an app on your smartphone or tablet, and loads onto the pedal via a wireless Bluetooth connection. The best news is that manufacturers Hotone are adding new sounds to the library every month (totally free of course).